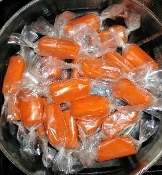 These delicious ORANGE CARAMELS will melt in your mouth. They taste like Orange Creamsicles! You will not be able to eat just one!! !